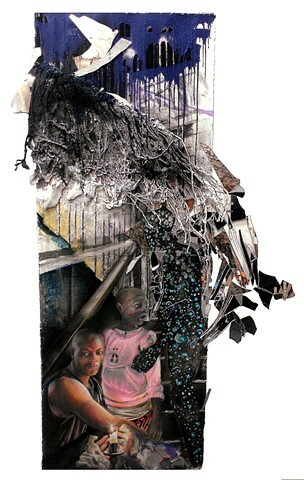 Broken Walls is an attempt to break down barriers form conventional ways of creating paintings or drawings. The stair case was inspired by a photograph I took of an abandoned 18 century factory building in Brooklyn. The narrative is a fictionalized concoction of collaged and found imagery that inversely reflects outwards through the use of mirrors and creates a mediated space where the viewers are merged and integrated into the overall composition of the piece.